﻿ What are the custom mobile app development benefits for business apps? In this era where mobile technology has spread its wings to every nook and corner of this world, it is but obvious that business sector will not be spared from its influence. Custom enterprise app development companies lend out their helping hands to the business organizations in defining a well-optimized smartphone application for the enterprise which is reported to render a high rate of conversion in comparison to desktop or mobile websites. In the world of cut-throat competition, startups and established enterprises steal the show by standing out clearly in front of the customers and this is possible only by engaging in mobile app development process. 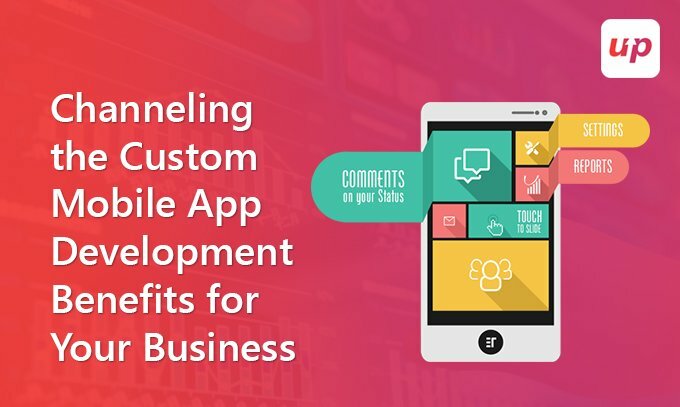 Custom apps add the much needed extra boost to the client conversation rate for the organization since they are tailored to meet the specifications of the targeted users as well as the company profile and work mandate. So, companies need to acquire the knowledge on how to channelize the benefits obtained from business custom mobile app development service. Enhancing customer relationship- Catering a wide range of customers ultimately defines the business success. Keeping them informed of updated products or services available to offer personalized service through notifications pushed to their system is the major target of custom mobile apps, crucial to maintaining a healthy customer relationship. Productivity and security improvement- Keeping customers satisfied is reaching halfway to increase the productivity of the business and such apps promise productive growth for a company. And there are data stored in the application to facilitate seamless sharing of data enhancing business operations. A security breach can prove detrimental leading to the loss of crucial business information to unauthorized parties. Giving different access permissions to employees and clients to the business website is one such security measures companies can adopt. Integrating with new and existing software- Applications need to function smoothly with existing company’s software as well as it must be receptive and flexible to adapt to the new software whenever they come up. Quick access to projects- the Mobile application designed can be utilized to cater internal work process as well which involves sharing of data and easy accessibility to all the work documents and tasks even when the executive is away from the office. Retrieving contracts and brochures shared with the clients become easy courtesy the customized apps. High scalability- Owning custom-made apps for enterprises designed by the professional mobile app developers can be easily scaled up pertaining to the changing requirement of the businesses. Generate revenue and maintain database- Such apps not only work in client acquisitions but serve as a revenue source for the business by charging extra for the app services. Along with the in-app advertisements add to raise income as and when the app is accessed by the customers. Also, such an app allows easy access to existing and new customer data, safeguarding the database from cyber thefts whenever needed. Easy to maintain projects- Custom apps give a real-time check on the project progress and deadlines. Updates are sent on completion of each segment of the project in hand and maintain the billing cycle for each stage of the project side by side to give a clear insight on the current status of the project to both the client as well as the executive involved working with it. Supports multiple devices- An enterprise comprises of employees owning different smartphones running on different versions of same or divergent Operating system owing to the popularity of ‘Bring your own device’ concept. Also, it is highly likely the target customers use different devices. Hence making the app compatible with all these devices gets crucial to facilitate smooth work process and capture wide customer base. Increase efficiency with the competitive advantage- Enterprise mobility solutions are business focused and need to be employee friendly such that the features can be sassily optimized by them to render good outputs thus enhancing the business efficiency. Also, offering a competitive advantage to the enterprise by making the business application visible to the customers.